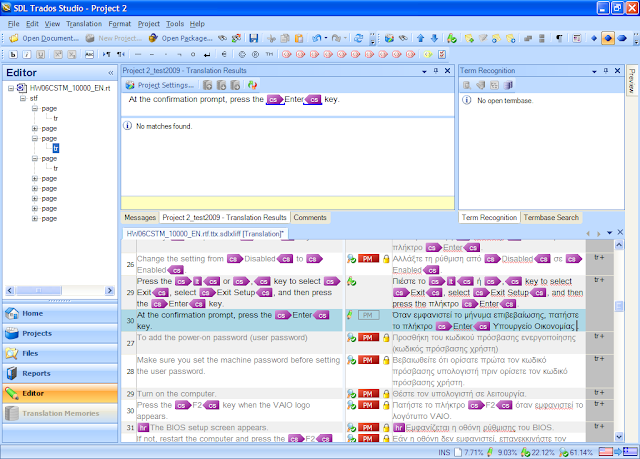 This is the first of a series of notes with the intention of reviewing the new and old features, as well as the performance of the new version of SDL-Trados, Trados Studio 2009 SP1. 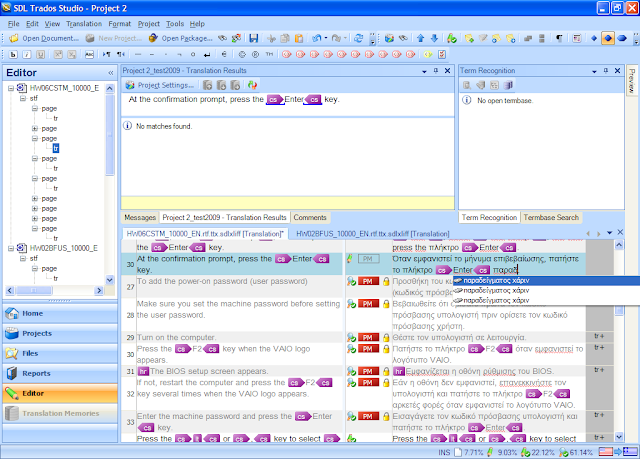 Autotext is a very handy feature and it feeds to the Autosuggest prompt. You can add manually entries (not recommended), import autoTxt files, import them from Trados TMs (the new format), or tmx files. Let as see how easy it is to add entries manually. You click on Tools - Options - Autosuggest - Autotext. You select Target Language, you type or paste your term on the Auto Text entries box and when you are finished you click OK. This is great, but slow. I would rather import from a list of entries which I might have exported from a different source or have stored in, say, word format. Do we know what format we need to use in order to import Autotext entries from a different source than those specified? No. 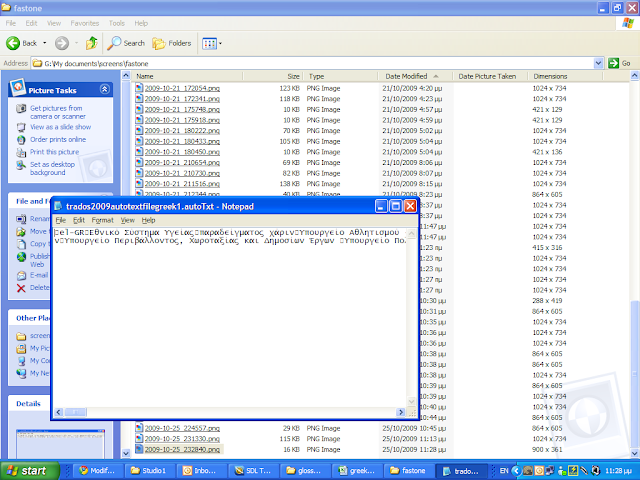 In order to find out what the format should be, I added manually a couple of entries and exported the file. It was a plain UTF-8 file with each entry occupying a single line. However, if you open the file in notepad, the line breaks are simply not there. I tried with different text editors like Notepad++ and EmEditor and it worked fine. Then I pasted my lines of entries and saved (always as UTF-8). Then imported the file. 2. 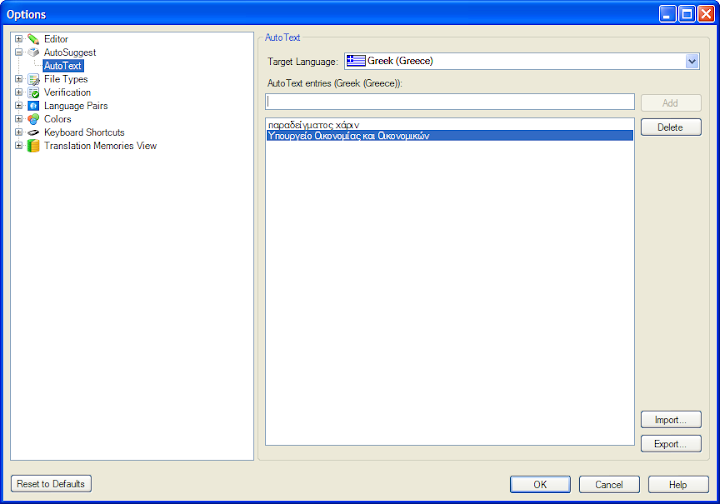 However, autotext entries are duplicated (no matter how you entered them) at insertion point. 3. When there are many Autotext lines starting with the same word, the system simply denies to produce them. 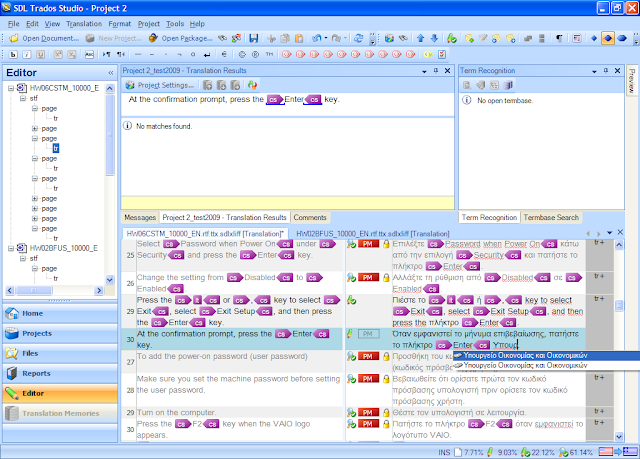 The result is that you type the full text of an Autotext entry. 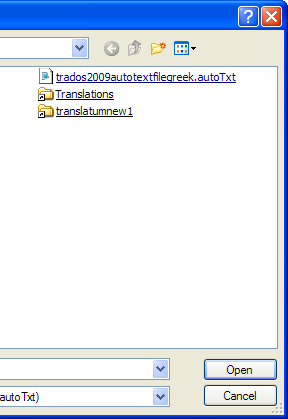 What the autoTxt file looks like when opened with Notepad. 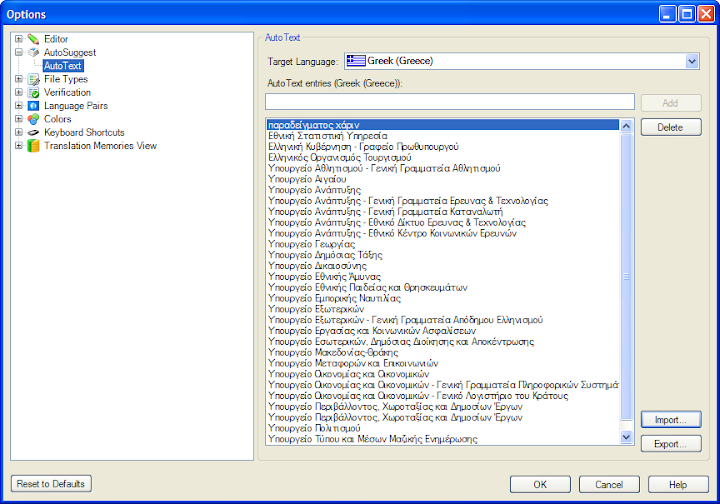 Tryin to get Autotext entries to work by typing Υπουργείο... to no avail. Deleting all entries (one by one - the only way offered by the system!) and leaving only a couple of them to see if the trigger forΥπουργείο... will work. 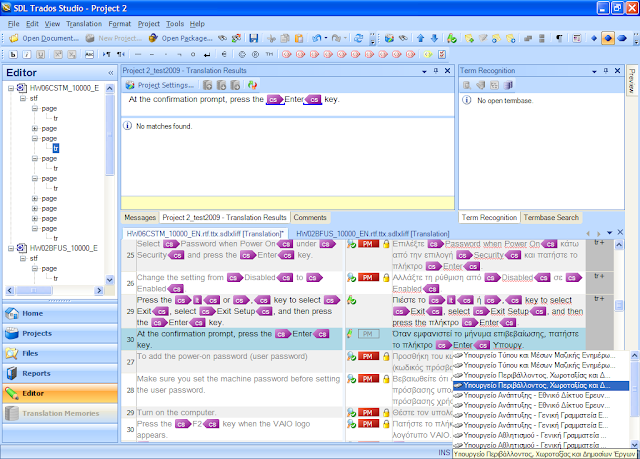 And the trigger works; however, although not a duplicate entry, produces a duplicate autotext line! And here is the result. Again, duplication! I keep adding them, and I see a scroll line appearing. This is good. 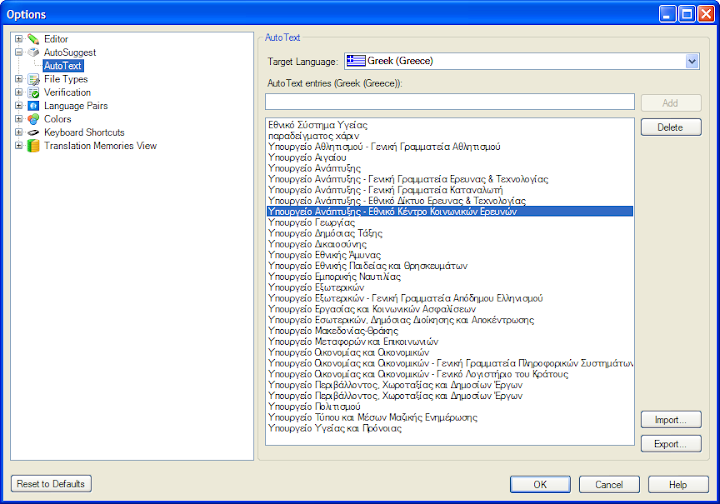 Now I add more Υπουργεία manually (adding the whole list again). Surprise-surprise. Although in the list no duplicates appear, in the system's guts, duplicates and triplicates reside! So, every time I import terms, duplicates are in fact not emptied, although it appears to be so!